Fact #1: The 2019 Oscars are a mess. Well past the point when a host has typically been announced and show planning is underway, the Academy Awards are without a host, after announcing and then losing comedian Kevin Hart within a 24-hour period, following the resurfacing of old, homophobic tweets. The show is in such desperate straits that they’re now reportedly considering the idea of not having a host at all. Fact #2: The Muppets are a beloved troupe of performers whose most endearing and long-running characteristic is that the characters always manage to turn a series of constant disasters to their advantage and somehow scrape together a great show. The thought that “The Muppets should host the Oscars!” is not a new one. Back in 2012, after a particularly ill-received hosting job from Anne Hathaway and a sleepy James Franco, the idea of The Muppets taking over the show became a movement of sorts on Facebook. Years later, that group still has 33,000 followers. And guess what? They’re not exactly wrong. It has become painfully obvious that no one particularly wants the Oscar hosting gig. The types of comedians typically considered for the role must walk the most ridiculously delicate of all fine lines between “too edgy” or potentially offensive, and so boring that the TV audience once again shrinks to record lows, as it did in 2018 with a precipitous 19 percent drop. Honestly, if you were a comedian, why would you want the gig? Who would be relishing the opportunity to host an overlong program that will inevitably be criticized for its length, and for bad jokes they didn’t even have the chance to write themselves? Hosting the Oscars is like a lose-lose scenario, and you can only hit the Emergency Billy Crystal Button so many times. At this point, what is there to lose in indulging the internet by giving an oddball troupe like The Muppets a chance? It’s not as if they haven’t appeared on the broadcast before—in fact, they’ve done pretty well! Tell me you can’t picture all of the obvious potential segments that The Muppets hosting The Oscars would offer. Kermit is your obvious opening monologue guy, sweetly and earnestly summing up the year’s accomplishments in film and schmoozing with the celebrities in the crowd. Fozzie Bear comes out to do some bad comedy, only to be riffed by Statler and Waldorf in the balcony. Scooter is running around backstage, trying to get The Muppets into costume and ready in time, mirroring the real-life chaos surrounding this particular Oscars. Dr. Teeth and The Electric Mayhem perform at least one of the Oscar-nominated songs, or back up the artists performing them. Miss Piggy tries to steal the Oscar for Best Actress like the vain glory hog she is. Bunsen and Beaker debut some kind of fabulous Oscars technology, only for Beaker to catch on fire. Gonzo attempts a death-defying stunt in a meta-winking attempt to desperately boost sagging Oscar ratings. I mean come on, the show practically writes itself, right? 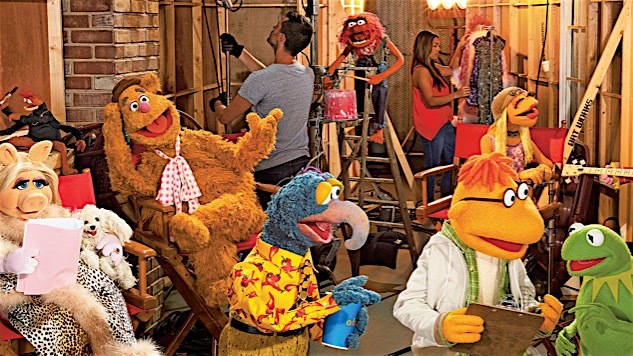 The Muppets foray into the format of single-camera sitcoms on ABC ended with somewhat mixed results, but as time goes by, it increasingly seems like a consensus has developed that we missed out on a potential gem. This was, after all, the show that gave us the sight of The Swedish Chef performing “Rapper’s Delight” at karaoke night. Just imagine what he could do in a floor show! Would there be technical issues to overcome, in having The Muppets host the 91st rendition of film’s most prestigious night? Sure, and relatively little time to overcome them. Would the team behind The Muppets even be interested in the gig, if offered? I can’t claim to have the slightest idea. But do I, as an audience member, want to bathe in the glory that would be Rowlf the Dog leading the Oscars orchestra pit? You’re damn right I do. It’s not like the organization has any other great ideas, here. So let The Muppets host the Oscars, and give us the first memorable Oscar broadcast in recent memory, succeed or fail.